This program allows you to translate 'Alternate Tools'-programs into other languages or to modify/correct existing translations. A wizard helps you to find the desired program easily and to add a new translation or to modify an existing one. As a precondition for the addition or modification of translations the desired program has to be installed first. 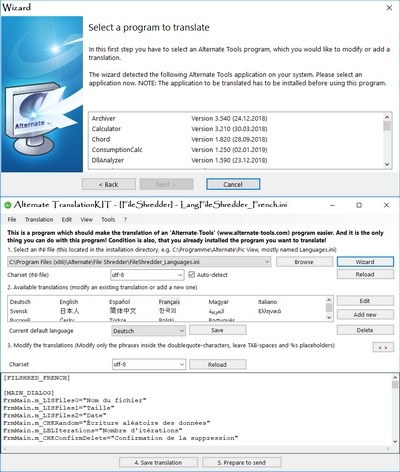 This program required administrative rights (it asks using the windows UAC) to modify the desired files inside the programs-folder. It requires the .NET-framework 2.0 (already included in operation system since Windows Vista).